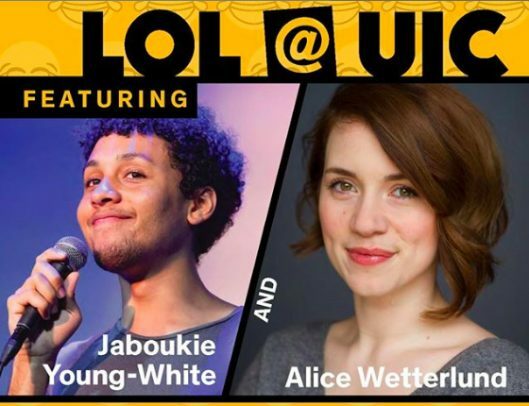 The UIC Student Activities Board’s (SAB) annual spring comedy show, LOL at UIC, will feature comedians Alice Wetterlund and Jaboukie Young-White. The event will take place Saturday, March 16, in Illinois Rooms, Student Center East, 750 S. Halsted St. Doors open at 6 p.m., and the show will run from 7 p.m. to 9 p.m.
Young-White is a commentator on “The Daily Show” and writer for Netflix’s “Big Mouth.” and Wetterlund has been featured on MTV’s “Girl Code” and HBO’s “Silicon Valley.” The comedians were selected for their successful performances and ability to appeal to a wide audience. The show is free for UIC students, but they must RSVP online. Each i-card holder is allowed one non-UIC guest. Tickets for additional guests can be purchased online. Tickets are $10 for faculty/staff/alumni and $20 for non-UIC guests.